The Identiv uTrust 2700 R is the ideal PC-Linked USB contact smart card reader for a huge variety of applications. Providing full compliance with all major industry standards such as ISO/IEC 7816, USB CCID, PC/SC, and Microsoft WHQL the uTrust 2700 R seamlessly works with virtually all contact smart cards and PC operating systems. The full support and compliance to EMV 2008 and GSA FIPS 201 expand the use to very specifi c use applications requiring additional security and data protection. It represents the perfect mix between modern stylish design, ergonomic handling and a compact foot print. The extended card data transmission rate of up to 600kBit/s with the support of TA1=97 enables shortest possible transaction times for maximum end user convenience. The Identiv specific SmartOS™ is featuring an easy and complete All information in this document is confidential and subject to change. 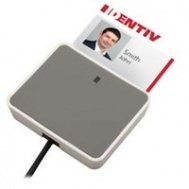 Identiv, Inc. documentation Rev 1.1.0 -2013-10-17 14 of 18 support of all major contact smart cards. The end user experiences convenience, transaction time effi ciency, security and reliability for use applications like network log-in, Windows authentication & Single Sign-On (SSO), banking and cashless payment applications as well as high security use cases for federal governments.